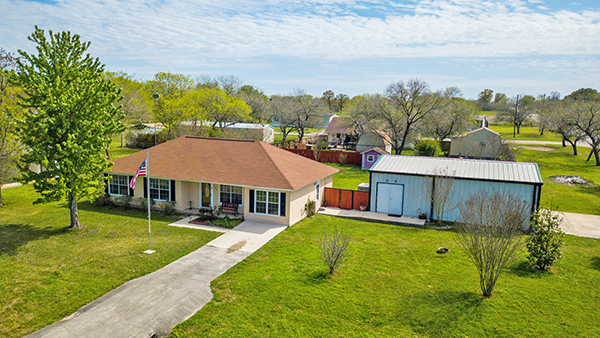 Allow me to introduce you to 105 Royal Crest Circle located in Seguin, Tx. This charming 3 bedroom with 2 full baths features an oversized 4 car garage, including a workshop, and is complete with half an acre. Upon entry, you’ll notice an inviting sitting area, warm colored paint palate, a custom chandelier, and ceramic tiled flooring. The home boasts a flexible layout including a formal dining and living room. The formal dining area allows natural sunlight to draw inside. The gourmet kitchen is equipped with a multi-colored mosaic backsplash, premier solid wood cabinets, marbled finish countertops, and stainless steel appliances. Moving to the living room you’ll appreciate the additional space, freshly painted walls, and the 2 custom ceiling fans. The indoor laundry room, generous in size, includes newly installed wood flooring. As you enter the spacious master retreat you’re greeted with custom dark wood flooring, new double pane windows, and a custom ceiling fan. The attached master washroom features a granite vanity with ample cabinet space, and a combined stand up shower and soaking tub. The additional bedrooms offer comfortable living quarters. Each room is carpeted and includes oversized windows, ceiling fans, and large closet space. The backyard continues to impress. Perfect for entertaining, notice the neatly maintained yard as you step onto your covered patio. Additionally, the detached 4 car garage has plenty of space for all your needs. For more information contact one of our REALTORS today!